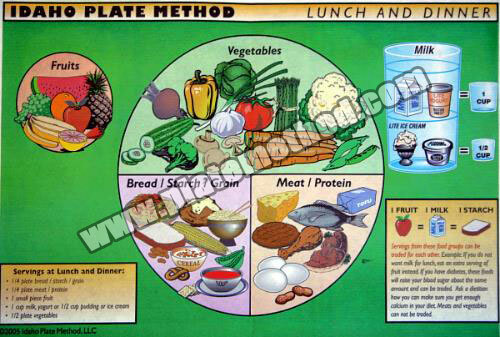 The Idaho Plate Method is used for diabetes meal planning. It also works well for weight loss, teaching good nutrition, and in improving blood glucose and lipids. Are feeling overwhelmed because of recent diagnosis or psychosocial circumstances. Are at a low-literacy level. Have had difficulty using more structured approaches. Are unlikely to follow through if you ask them to measure their food. Have Type 2 diabetes and need to lose weight. Are inpatients who need "survival" information. © Copyright 2018 Idaho Plate Method. All Rights Reserved.